To my mind, this is a really clumsy-looking crew cab, and the step arrangement is quite prehistoric. Even the HCB Angus crew cabs on the D series Fords we sold half a century ago in 1967 had enclosed steps! It certainly does not rival the cabs which have been available on Atego chassis for many years from such companies as Rosenbauer, Ziegler and Lentner - not to mention many other French, Scandinavian and central European firms. I have to wonder if it was all a question of cost; although this may not have actually been a bargain basement effort, it certainly has succeeded in looking like one! Added by Rob Johnson on 03 May 2018. I agree, Rob; they really do stink of a dreadful, cheap looking make-do, cost-cutting offering. Yet the LFB's "powers-that-be" claim they offer an unrivalled spacious interior for the crew, amongst much other propagandist waffle. Talking of rubbish, they definitely have a bin wagon look about them. Added by Yelp Bullhorn on 12 May 2018. Living in America, I have learned to call bin wagons "garbage trucks". Added by Rob Johnson on 17 May 2018. 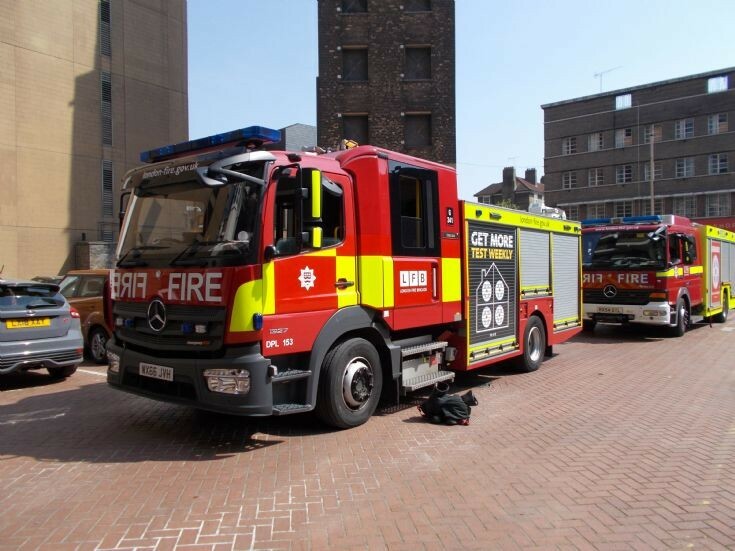 Not to mention BSPP's Desautel FPT pumpers, which look really elegant and carry an eight member crew!